Windsor at Westside is a gated vacation rental community close to Disney featuring an 8,000 sq.ft. clubhouse with the Tu Casa Bar & lounge, market & deli, video arcade, sundries shop & fitness center. Other fantastic amenities such as a playground, volleyball court & multi-purpose sports courts. Best of all is the large resort-style pool with lazy river, water playground with slides, cabanas and tiki bar! 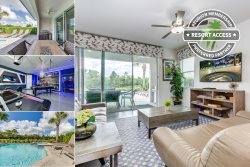 This luxury vacation home is just eight miles from Disney World, Animal Kingdom and Orlando’s world-famous attractions, shopping, and dining. This home is just quarter of a mile from the fantastic community pool and clubhouse. With 3,275 sq. ft of space, this Florida villa has something for everyone in the family. With an open layout in the living room, dining area and kitchen, the family can enjoy quality time together. The breakfast bar can comfortably seat 3 while the dining table has seating for 6. The kitchen has all stainless steel appliances and granite counter-tops. The living room has ample seating surrounding the 50" SMART LED TV with Blu-Ray player. Walk outside to your private screened pool are with spillover spa. A table with seating for 6 and additional sun loungers allow for everyone to pay poolside and soak up the warm Florida sun. This 6 bedroom, 4.5 bath luxury villa sleeps 13. The bedding arrangement makes this villa perfect for large family's or families looking to share. You will find large King Master suite on the first floor complete with King size bed, large 50" TV, and an en-suite bath with walk-in shower and large soaking tub. Upstairs is another King suite with 50" LED TV, and an en-suite bathroom that has a walk-in shower. The second floor also has two more large size king bedrooms with 40" LED TVs. 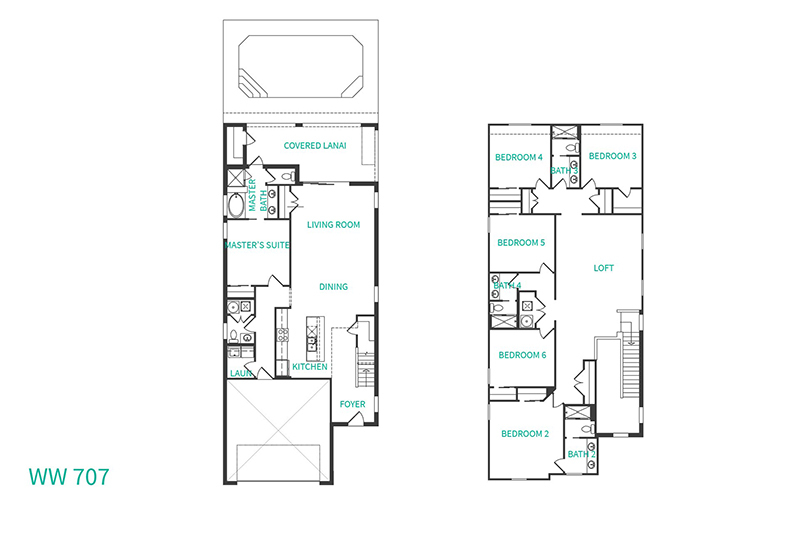 There are two more bedrooms suited for children, one with two Full-size bunk beds and bonus pull out twin trundle bed, and the other with two Twin beds. After a long day at the park, kick back in the upstairs den, enjoy some popcorn and watch a movie on the PlayStation 4 games console on a huge 70 inch LED TV. There is also a Pool table and Foosball table to entertain the whole family. With all of this and more, this home provides everything you need to relax and enjoy your Florida vacation in style. An Accidental Damage Protection (ADP) fee of $89 plus tax will be required to cover any reported accidental damage to this property and its contents. Pool heat available for $30 a day and is recommended from the 31st Oct. to the 31st Mar. The home we rented was large and perfect for the number of people we had. It was clean and the beds were comfortable. Great accommodations with a comfortable price!